Red multi color granite is one of the popular choices among the red granites. But these granites are found in smaller number than tan, green or gold shaded granites. And it makes this granite very much esteemed and valuable to the other individuals. This particular granite is a blend of different shades where red dominates the other colors. The base color of this granite is red and there is a combination of brilliant colors like browns, yellows, whites, lavenders etc. Red multi color granites are medium grained and are available in light and dark shade also. India is the originator country of Red multi color granite. What makes the granite red? Red multi color granite has large absorptions of both feldspar and mica which can both offer granite the red shade. All type of red granite can have changeable amounts of any of these minerals, which provide the granite a pink, orange or bright red tone. There are different qualities of Red multi color granite which has made it an acceptable choice across the globe. Such as, striking appearances, horizontal finishing and extremely lustrous. On the other hand, it is durable, heat and scratch resistant and extremely strong in nature. These granites are used in various purposes like making countertops and tables, wall cladding, floorings etc. This granite brings an idealistic and warm feel to the surroundings of the hotels, resorts, homes, commercial establishments etc by means of its color combinations. Red multi color granite is brilliant and positive and at the same time it is warm and welcoming. These distinctiveness have made it an outstanding choice for a multiple scheme both small and large. Here are some examples of using the red multicolor granite. Red granite is often broken down into pieces which are about 14 millimeters in diameter and are put up for sale in bags that are about 55 pounds. These red granite stones are perfect for landscaping or the walk way around the garden. Red granite is often used as curbing. Because Red multi color granite has a attractive appeal and it lasts for a long period than concrete. Red multicolor granites have an extensive use as pavers and as attractive choice for walkway. Because this particular granites are rarely used to pave the streets of cities. There are a lot of memorials in the world which are made of Red multicolor granite. The Veterans’ memorials are one of the famous creations of this granite. 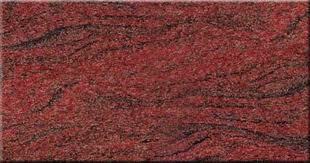 The Red multicolor granite creates an exceptional choice for backsplash or kitchen countertops in your home. Red multicolor granites are more exclusive than a number of other red granites, and it is one of the pricy granites among the red granites. So, it requires extra care for enhancing your home décor.